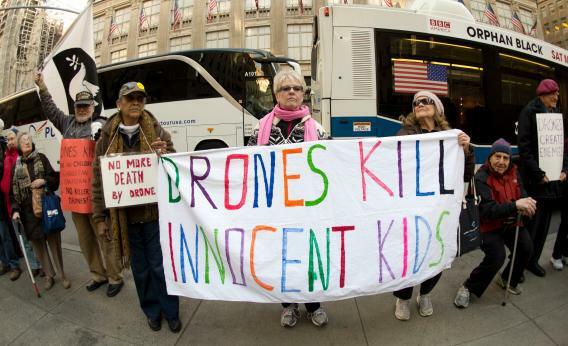 Drones in Pakistan: Does Mark Mazzetti’s New York Times expose discredit the war? “A Secret Deal on Drones, Sealed in Blood,” says the front page of Sunday’s New York Times. The story’s opening paragraphs portray the drone war in Pakistan as the product of deceit, murder for hire, and a willingness to kill civilians. But the article, adapted from Mark Mazzetti’s new book, The Way of the Knife, tells a more complicated story. The drone war isn’t as clean as its masters pretended. Nor is it as dirty as its critics often imply. 3. The U.S. and Pakistan agreed to conceal or misrepresent who did the killing. According to Mazzetti, in the 2004 deal to permit Predator strikes, the CIA and Pakistan’s intelligence agency agreed that the U.S. “would never acknowledge the missile strikes and that Pakistan would either take credit for the individual killings or remain silent.” After Muhammad’s death, a Pakistani military spokesman falsely told reporters that a Pakistani rocket attack had killed Muhammad and that the U.S. had played no role. 5. The deal protected other terrorists. According to Mazzetti, “Pakistani intelligence officials … insisted that drones fly only in narrow parts of the tribal areas—ensuring that they would not venture where Islamabad did not want the Americans going: Pakistan’s nuclear facilities, and the mountain camps where Kashmiri militants were trained for attacks in India.” This detail, tucked away in the story’s 26th paragraph, is in some ways the most damning revelation. It undercuts the anti-terrorist rationale behind the deal. Do these disclosures discredit the drone war? I don’t think so. To answer that question, you have to look more deeply at the context. It may be true that the exposure of post-9/11 interrogation abuses in 2003 and 2004 pushed the CIA away from detention and toward targeted killing. But that process was already underway. Toward the end of the story, in the 40th paragraph or so, you’ll learn that the CIA’s internal debate over the morality and legality of armed drones actually peaked in 2001. What settled that debate was 9/11. We decided to kill the people who had killed us by the thousands. In short, Muhammad wasn’t just Pakistan’s enemy. He was ours, too. He was targeting our people. So we weren’t just offering to do Pakistan’s dirty work. We were picking the guy on our list whose death was most likely to whet the appetite of our would-be collaborators. A subsequent cease-fire soon collapsed. Muhammad “resumed attacks against Pakistani troops, and Mr. Musharraf ordered his army back on the offensive in South Waziristan.” This is what the U.S. strike on Muhammad shattered: not peace, but a bloody ground war full of civilian casualties. These caveats don’t make the drone war honest, brave, or clean. But they do challenge us to be as careful in criticizing it as we expect the government to be in conducting and justifying it. The rise of the Predators over Pakistan wasn’t innocent. Neither were the terrorists who provoked it, the ground wars that preceded it, or the blood that sealed the deal.